Remember the time when musicals were supposed to be fun and no one cared about messages and real life? Well, this is one of those shows and the score sounds even better in this movie soundtrack than on the Original Broadway Cast. The guys responsible for the score of MGM’s hit SEVEN BRIDES FOR SEVEN BROTHERS, composer Gene de Paul e lyricist Johnny Mercer, teamed again for this musical adaptation of Al Capp’s comics strip and the result was a Broadway hit that opened in 1956. 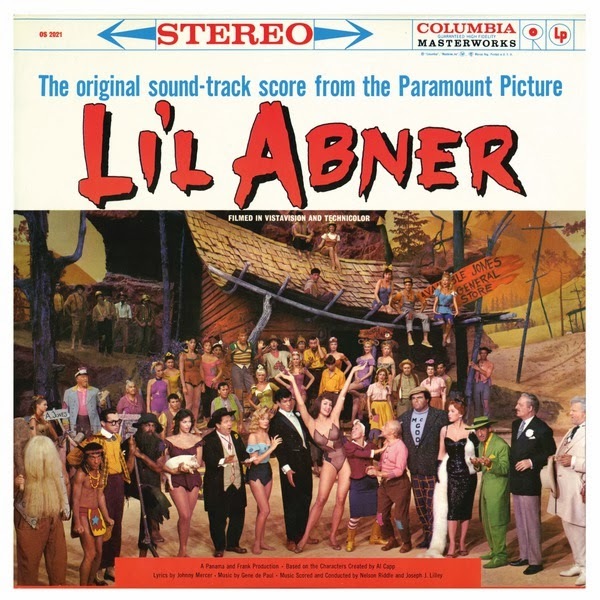 Three years later the show was adapted for the screen with the score almost intact and with some members of the Broadway cast, Peter Palmer, Stubby Kaye, Julie Newmar and Howard St. John, repeating their roles. So what we have here is a very entertaining score, which was delightfully adapted for the screen by Nelson Riddle and Joseph J. Lilley. It begins with a very cinematic opening, followed by “A Typical Day” that introduces us to the colorful characters, and ends in a happy mode with “The Matrimonial Stomp”. Between those numbers there are irresistible tunes like “If I Had My Druthers”, “Namely You” and “I’m Past My Prime”. The entire cast sounds like they’re having fun, the songs are catchy, there’s plenty of humor and we can almost see the choreography; put all this together and we have a highly enjoyable recording. A great way to begin 2014!